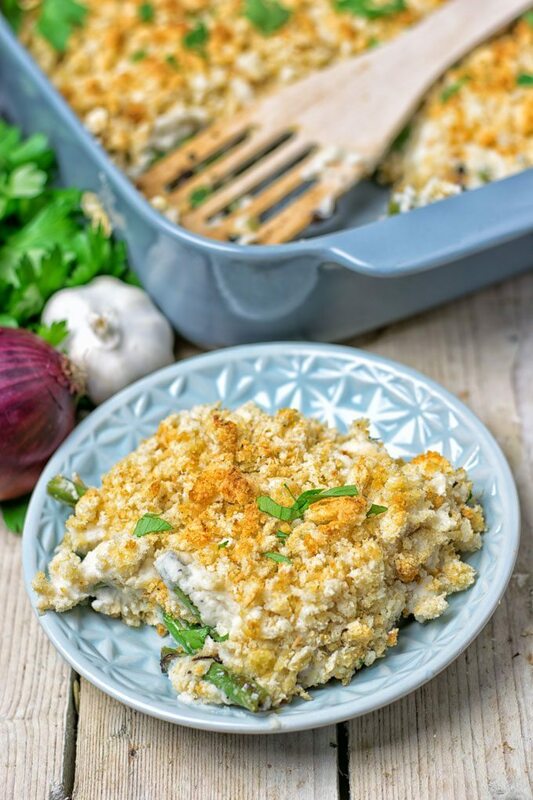 Mashed Cauliflower Green Bean Casserole with just 6 ingredients and made in 3 easy steps. Treat yourself to the best delicious vegan comfort food ever. Comfort food is everywhere. It’s here and there, you can smell it, taste it. For everyone comfort food means something different. What does it mean to you? I came up with this recipe when I had guests over for dinner. Some of them are really picky eaters and this is always a perfect opportunity for me. You have to know I was really excited to create this dish, because when you serve it to these really picky and meat loving people, that’s a challenge. And I like a good challenge. When you want to please a meat loving crowd like this, it can be tough. So with this in mind, I definitely wanted to go for comfort food. For sure the temperatures here in the Netherlands are going down. Lately it’s started to get colder and colder, even below freezing. You can call yourselves lucky if you live in a warmer place. On those cold days, I’m craving comfort food like my Sweet Potato Casserole or my Leek and Potato Soup. Would you believe me, friends, when I tell you that this is my first recipe with green beans? No joke it’s for real! I assume the reason is that I just wasn’t really a friend of green beans. Until this recipe, that is. Back in my childhood days I did (have to) eat a lot of green beans. Often they came served with mashed potatoes, gravy, and some meat. Obviously, this is not a dish for me any more! Before I was going vegan I had tried green beans a couple of times, but never really managed to get a soft spot on it. Maybe those were overcooked or were simply lacking flavor too much. Hello bland food! Today the situation is different. In this recipe, I really adore what green beans add to this flavor profile. And this is exactly why I had to share this dish with you, friends. This is definitely a dish for everyone. Yes I would say this is the dish for the pickiest eaters, meat lovers, kids, plant based haters, and of course for all vegetarians and vegans.. Seriously this is the dish that you can serve the whole year because it’s so satisfying and light, warming and fresh. It also makes a great plant based appetizer, side, or main dish. You can serve it plain or with other veggies, lentil meatballs and so many more things. I made this recently again and served this with my 30 Seconds Best Hummus Recipe and my Turmeric Falafel. It was so delicious, I couldn’t get enough from it. And this means a lot when you know I really never was a big green bean fan until now. 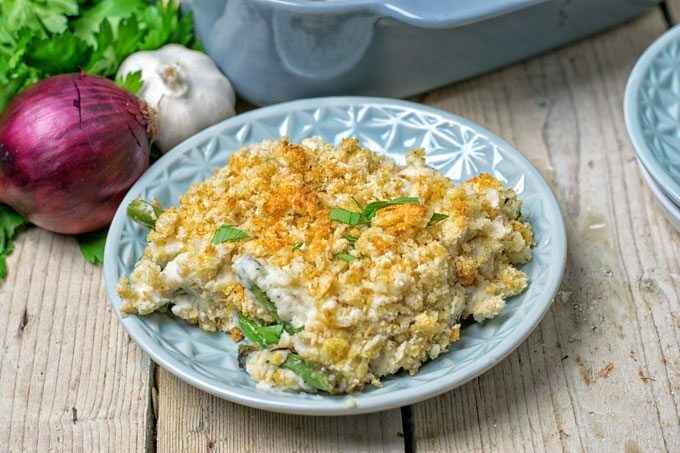 This Mashed Cauliflower Green Bean Casserole was devoured in no time. And by know you know it’s comforting, warming, creamy, cheesy, meat lover and picky lover approved, fall and all year devoted, mesmerizing, and versatile. Should I start? Ok, let’s first cook your cauliflower florets in a steamer in the microwave for around 8 minutes. Or just cook them on the stove, which might take a bit longer. Heat a skillet with a bit of oil or just with vegetable broth, that’s up to you. Add onions and green beans and cook them. When the cauliflower is done, give it into a bowl of a blender or food processor, add coconut milk, nutritional yeast, season with salt and pepper. Then blend until really creamy and smooth. Don’t worry if you don’t own a blender or food processor you can do it with a potato smasher. Next prepare the topping from my Kale Pasta Casserole and add nutritional yeast. Last, assembling is an easy play as always: start with the green bean mix, followed by the mashed cauliflower, and end with the topping. Bake for around 15 minutes at 405°F, done. Let’s face it, I was not really into green beans but do you know these health wonders are high in Vitamin C? Hello immune booster! At the same time, they are low in calories, rich in fiber and folates. 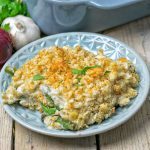 You get the picture: this Mashed Cauliflower Green Bean Casserole is a feel good package for you, even if you were like me not into those beans. This might be an excellent start to convince yourself. If you are not on the Green Bean ship yet, you might want to check this overview “10 Amazing Benefits Of Green Beans“. Friends, if you give this a try, let me know. Snap a picture, tag me on Facebook or Instagram as always. 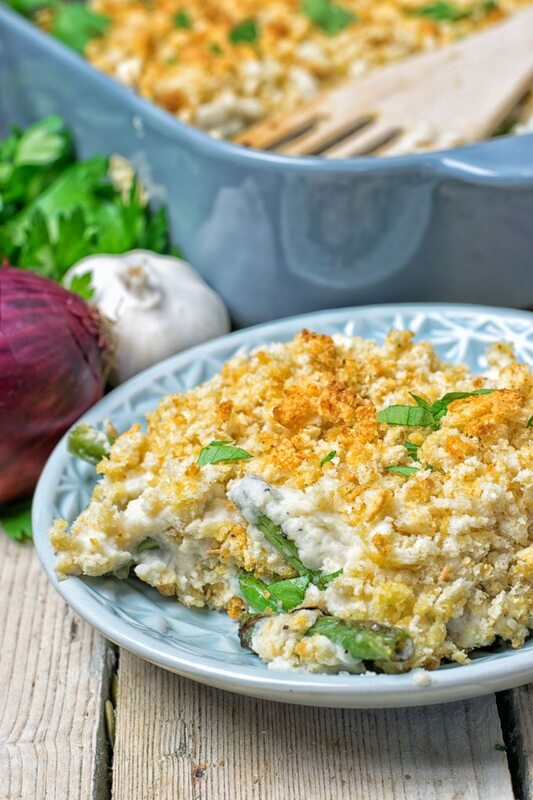 I guarantee this Mashed Cauliflower Green Bean Casserole will do the trick for all, kids, picky eaters, meat lovers and, of course, for all of plant based lovers we are. Cheers, enjoy and see you soon, Florian. Cook cauliflower florets in a steamer in the microwave for around 8 minutes. Or just cook them on the stove, which might take a bit longer. Heat a skillet with a bit of oil or just with vegetable broth, that’s up to you. Add onions and green beans and cook them. When the cauliflower is done, give it into a bowl of a blender or food processor, add coconut milk, nutritional yeast, season with salt and pepper. Then blend until really creamy and smooth. Don’t worry if you don’t own a blender or food processor you can do it with a potato smasher. Next prepare the topping from my Kale Pasta Casserole and add nutritional yeast. Last, assembling is an easy play as always: start with the green bean mix, followed by the mashed cauliflower, and end with the topping. Bake for around 15 minutes at 405°F, done. I really, really love traditional green bean casserole Florian! 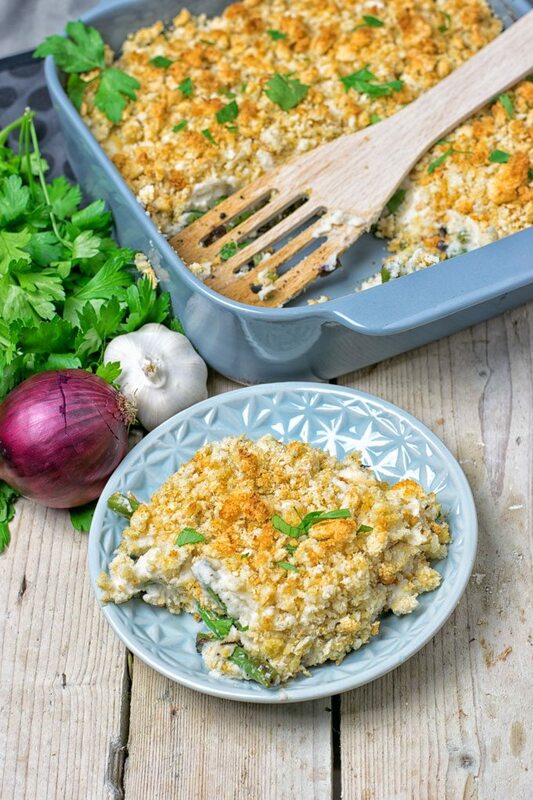 This is so different than that, what a lovely twist to add cauliflower and no mushrooms! It’s so different than what I grew up on and I love that you added more garlic, there can never be too much garlic! That crust on top would definitely add a lovely crunch that would be addictive! Love that you used coconut milk too, that is one of my most used milks I love to use in recipes, so creamy and delish! Well Challenge accepted and WON!!! THis looks incredible! Do you think this would be ok to freeze and reheat? Or how many days does it keep refrigerated? Hi Anneliese! I haven’t tried that before but I would say it should work. I think it will keep fresh in the fridge for at least 3 days. Let me know what you think. What a delicious comfort meal. I added a little more nutritional yeast and some chopped kale and served with baby filled potatoes from our garden. The beans and kale are from the garden as well. I also did a mixed wild , brown rice and quinoa for a second choice and for the leftovers. Everyone loved this. Thank you for the beautiful photos and the post. Much appreciated. Thanks so much for your amazing feedback, Joani! Glad it was such a big hit! Hope you will try lots of more recipes! 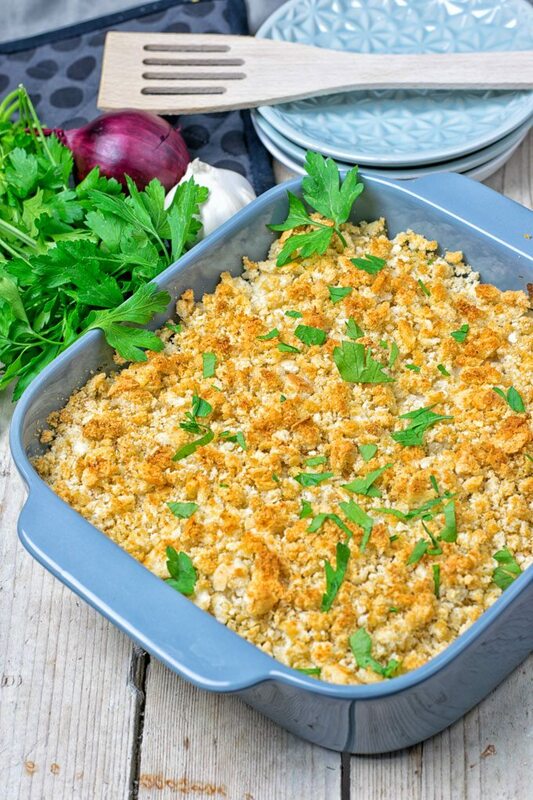 For this casserole, is it canned coconut milk or just regular coconut milk in a carton? Where would I find nutritional yeast or is there an alternative to that ingredient? Can’t wait to make the recipe! Yum! Hi Ally! I used canned coconut milk. You can find nutritional yeast at most stores, or online. Hi – this looks delicious- do you use unsweetened coconut milk or sweetened? Hi KT! I used unsweetened canned coconut milk! This is just lovely to eat. I love both cauliflower and green beans, and coconut milk, I’d never had thought of combining and it works so well. It’s a magic combo! Glad you enjoyed it so much! a plant-based diet in general does not automatically mean no oil and no nuts. Oil is extracted from plants and so are nuts, obviously. In many of my recipes, I do also give options to replace the oil I use, for example for frying, by vegetable broth. If you keep looking around, you will also find recipes here without nuts. Normally a plant based diet would include nuts but if you have a heart problem it is recommended to not eat oil and nuts. You will love this, Jenna! Hi! Do you use canned coconut milk or carton/bottled coconut milk? Thanks! Hi Michelle! Indeed! I used canned coconut milk! Would almond milk work? That just what I have at the house right now I didn’t plan to get out any more tonight. Thanks! Hi Amy! Almond milk will work, but it’s thinner than coconut milk. Use a bit less, otherwise it will turn out runny. Trying this recipe for the simple reason we are trying to eat healthier and this sounds amazing, also my 8 year old has ADHD and trying to do things gluten free… and healthy so this recipe is a winner… Cooking is in process as of right now. I am going to add cheese to it tho because I like everything better with cheese. Thanks for making it, Jolene! Happy to help and enjoy! If I use coconut milk from the carton should I use a bit less then? That’s a good question, Jolene! This will vary on the brand you will use . Not all brands are the same so I can’t vouch for accurate results. I would say try for yourself and adjust if needed. 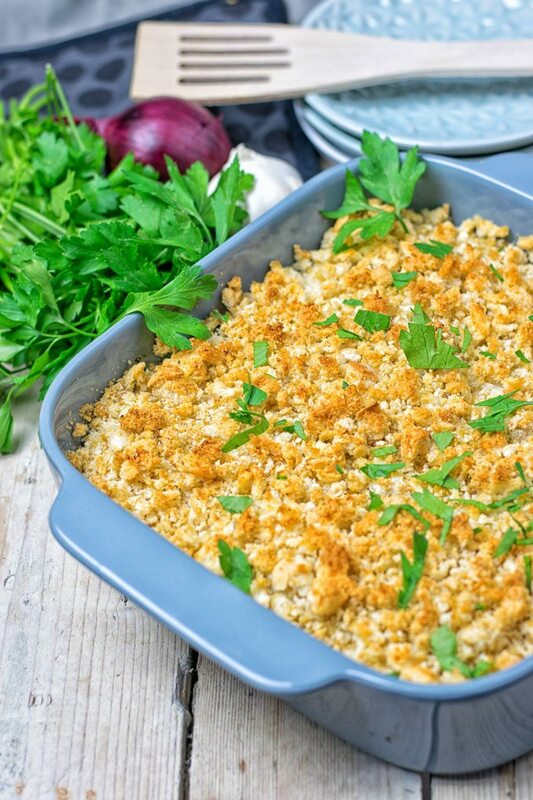 I made this the other other night and used g-free bread crumbs for the topping. 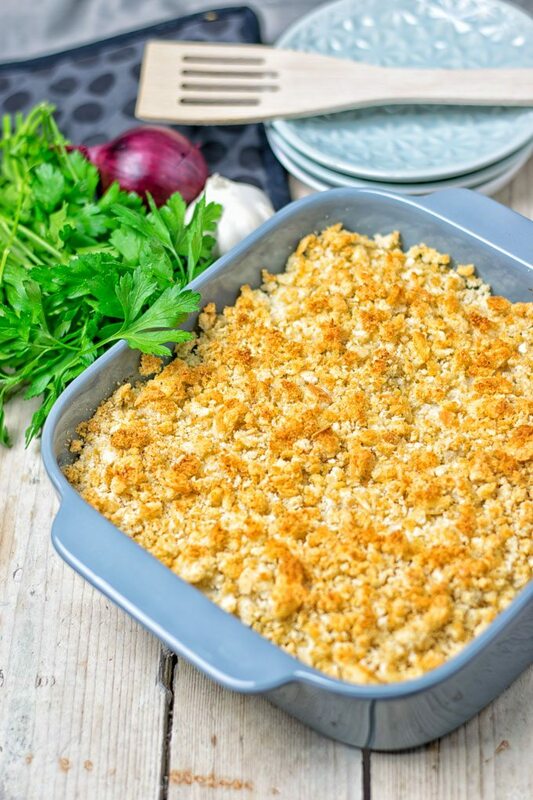 I really love this recipe and it is a great way to experience comfort food in a healthy way! Even my meat, dairy, and gluten loving boyfriend liked it! I will be checking out more of your recipes. Thanks for sharing! That makes me really happy, Akillens! Glad it was such a big hit! Really hope you will continue to try lots of more recipes. Hello! What type of pan do you suggest baking it in? Also, is the 1/4 nutritional yeast that’s added to the topping included in the 1/2 in the ingredient list…or in addition to? Thank you! Hi Heather! I used a 9×9 inch baking pan! You add the 1/4 cup nutritional yeast to the topping. It’s not included! Thank you again! Can’t wait to try this! Hi Rose! Just leave it out and use more seasoning to your own liking. Hi Zoe! Thanks so much for your amazing feedback! Glad it was such a big hit! I haven’t a cookbook right now, but let’s see what the future holds. Really hope you’ll find lots of more recipes to try! Hello! Can I make most of this the night before, put the pan in the refrigerator, and then the next day just add the topping and bake? Thank you! I haven’t tried that before but I would say why not. Let me know how it goes! This recipe is a WIN! Me and the girls at work are doing plant-based for the month and once a week each one of us makes breakfast and lunch for all five of us. We had this one today and everyone was all oohs and ahhhs. I did add mushrooms also cuz I love me some mushrooms. This is going to be a total GO-TO! Thank you so much!! Thanks a bunch for your amazing feedback and making it, Cass! Glad it was such a big hit for all! I hope you’ll find lots of more recipes to try! I just made this and it is fabulous. I followed the recipe except I used frozen cauliflower (laziness). It still came out terrific. Thank you! Thanks for making it and your amazing feedback, Karen! I hope you’ll find lots of more recipes to try!